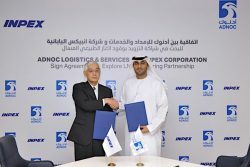 INPEX Corporation (INPEX), Japan’s largest exploration and production (E&P) company, says it has signed a Memorandum of Understanding (MOU) with ADNOC Logistics & Services to form an Liquefied Natural Gas (LNG) bunkering partnership in United Arab Emirates. INPEX and ADNOC have a strong and well-established partnership since 1973 when INPEX was awarded a part of the ADNOC Offshore (Abu Dhabi Marine Area) concession. In addition to Upper Zakum concession and Abu Dhabi Onshore concession, in February 2018, ADNOC awarded INPEX a participating interest in the Lower Zakum concession offshore Abu Dhabi as well as a 25-year extension of the Satah and Umm Al Dalkh concession, also offshore Abu Dhabi. ADNOC Logistics & Services provides world-class shipping, maritime, port, and logistics, serving ADNOC and international customers. ADNOC Logistics & Services is a crucial link in the ADNOC supply chain, delivering the Group’s oil, gas, petroleum and dry bulk products from Abu Dhabi to the world and also serving global customers.